A torque wrench is a hand tool used to precisely apply a specific torque to a fastener such as a nut or bolt. It is usually in the form of a socket wrench with special internal mechanisms. It was invented by Conrad Bahr in 1918 while working for the New York City Water Department. It was designed to prevent overtightening bolts on water main and steam pipe repairs underground. A torque wrench is used where the tightness of screws and bolts is crucial. It allows the operator to measure the torqueapplied to the fastener so it can be matched to the specifications for a particular application. This permits proper tensionand loading of all parts. 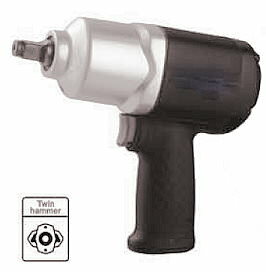 A torque wrench measures torque as a proxy for bolt tension. The technique suffers from inaccuracy due to inconsistent or uncalibrated friction between the fastener and its mating hole. Measuring bolt tension (bolt stretch) is more accurate but often torque is the only practical means of measurement. The simplest form of torque wrench consists of a long lever arm between the handle and the wrench head, made of a material which bends elastically in response to applied torque. The deflection at the handle is proportional to the applied torque and material constants of the cantilever arm. A second, smaller bar with integral mechanical indicator is also connected to the head; this is never subjected to torque and thus maintains a constant position with respect to the head. When no torque is applied to the lever arm the indicator rests parallel to the lever arm. A calibrated scale is fitted to the handle so that applied torque, and the associated deflection scaled as torque of the main lever, causes the scale to move under the indicator. When the desired torque is reached (as shown by the indicator), the operator stops applying force. This type of wrench is simple, inherently accurate, and inexpensive.